I have mentioned the Nikon AW100 on this blog before and regular readers will know that my daughters have one of these cameras and that I have been borrowing it for many of my adventures. The lovely people at Nikon UK, sent me an updated version of their AW100, the AW110 to test out and review. The AW110 comes in Camouflage (as you can see below), Black, Blue and Orange. Built for action! (And families)! The ruggedness is enhanced by the camouflaged livery! The first thing I noticed when powering on the camera is that the screen is a big improvement. It is now an OLED 614K-dot which is clearer and brighter. It is pretty good in most lighting conditions and I really liked it. 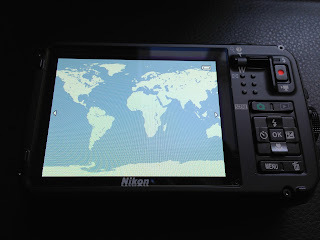 The 460K-dot screen on the AW100 is still very good but this updated version is better. As far as size goes it slightly larger here and there but we are talking millimetres so you would be hard pressed to be able to tell them apart. I am really pleased that Nikon has decided to keep the locking mechanism which is possibly the best I have seen on any tough camera. You push the button, turn and open it up. Locking it, you hear a reassuring click. The waterproof seal looks substantial and I know that they work really well at keeping the innards dry as my daughters cameras have been taken many a plunge in water and survived to tell the tale. The layout on the AW100 was pretty good but Nikon have improved things further with a better zoom toggle. 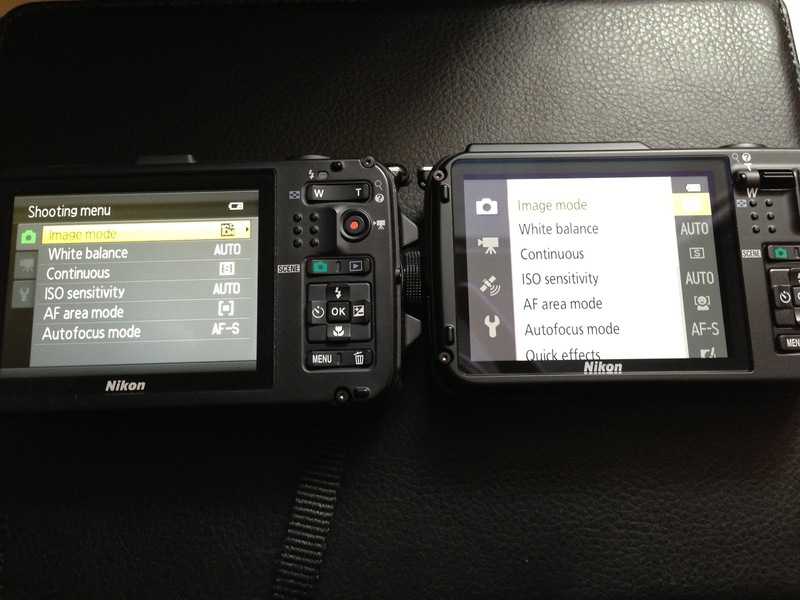 Rather than a left and right button on the old camera, it now has a smaller but easier to control up and down button. It works really well when wearing gloves too. The image quality from the AW110 is extremely good. I have been very happy with the results I have obtained. The colours are vibrant and accurate and images sharp - typical Nikon. The great thing about this camera is that you can set it to auto mode and let the magic inside the Nikon AW110 do all the hard work for you. Nikon compact cameras are good at this. It is almost like being Luke Skywalker at the end of Episode IV when Obi Wan tells him to use the Force and turn off the computer. Luke does this and still gets the shot. The photos below were taken at the Tweed Run I attended on Saturday - straight out of the camera. I need to explain why I have chosen these particular photos. When I took these photos it had started to rain and the light had deteriorated. The only other people I saw with cameras were the pros using weather sealed DSLR's and lenses costing a few thousand pounds. In addition to this I was riding a bicycle, taking the photos with one hand and travelling at about 9 - 10 mph, trying to negotiate a very busy Parliament Square and not crashing into the other 300 or so riders, pedestrians and other road users. I think that if you take all this into account, these photos are excellent. The AW110 has a lens-shift vibration eduction system that helps to ensure that your photos and videos are steady - even if your hands aren't. it also has a clever motion detection which automatically selects a faster shutter speed and higher ISO helping to obtain sharper and clearer shots. The macro facility on this camera is nothing short of brilliant. It is quoted as being able to focus on something up to 1cm away but I found that I could get closer. It can be activated quite easily by its own dedicated button. 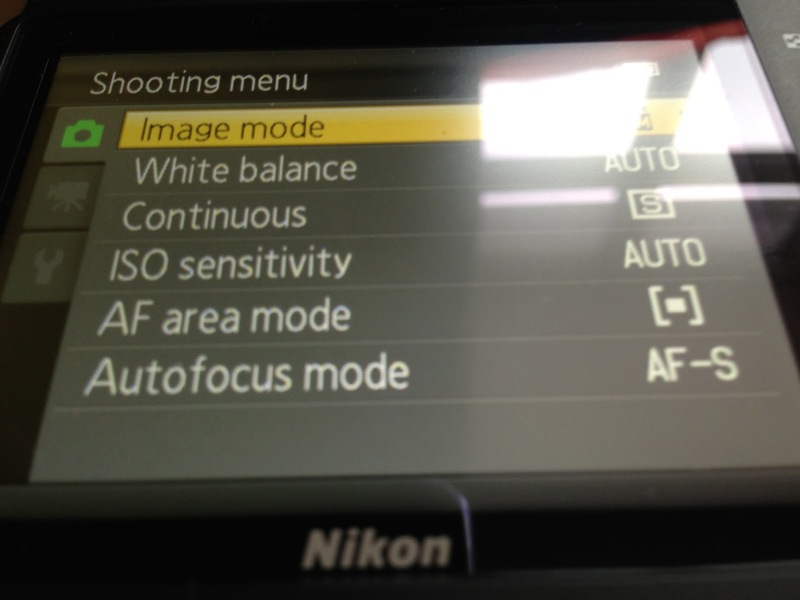 You can also use the macro mode to create bokeh, where the background is thrown out of focus. This is certainly true of the first photo. The photos below are of tiny flowers by the way and only have a diameter of about 1cm. I was able to get so close to them they look larger than they really are. The AW110 when turned on is pretty quick and you are able to start taking photos almost instantly. In daylight I found that I could take one photo almost instantly after another with little in the way of lag or waiting around. The menu system is intuitive and easy to use. There are many settings that you can customise such as white balance, focusing mode and scene mode but I tended to keep things on auto and was very pleased at the photos I obtained. The look of the menus have been tweaked from the older AW100 and my nine year old daughter found no difficulty negotiating her way around them. A new feature on the AW110 is WiFi. You can download a free app if you have an iPhone/iPad or Android device. With this you can connect the camera to your phone. Very clever. 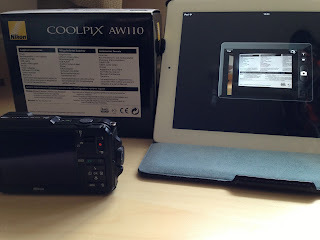 Pairing the AW110 to my iPad took seconds and worked really well. The phone creates its own WiFi network which the phone can securely link to. Once done I found the connection to be very stable and you didn't have the annoyance of it cutting out. A really good feature is the ability to control the camera and to be able to take a photograph from your phone or iPad. In the picture below you can see the camera pointing at the box. The iPad has an image of the camera and the screen showing what the camera sees. It is really clever and I can think of lots of uses. Using it for underwater shots would be good as would awkward angles or stealth shots. The AW110 doesn't have a touch screen but it does have a very clever alternative 'glove mode.' This is activated by the push of a button on the side of the camera. 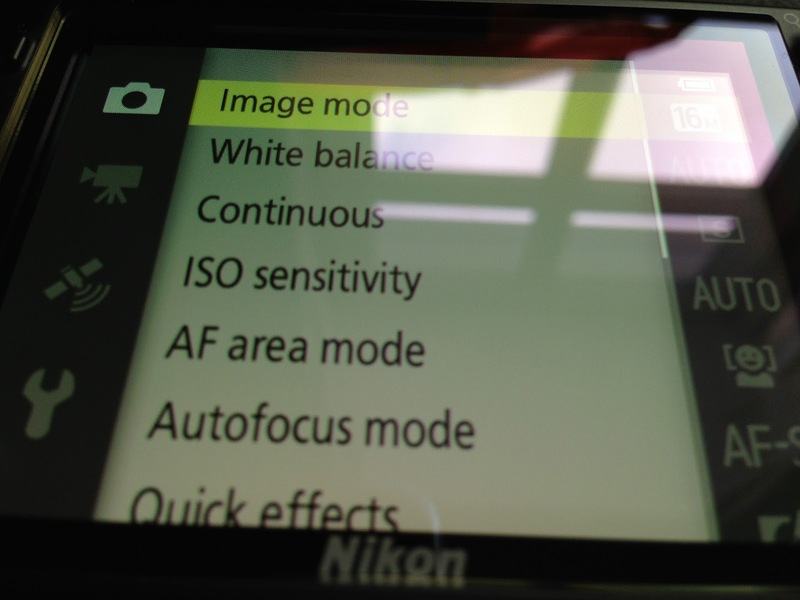 In doing so by tilting or shaking the camera back and forth you can cycle through basic functions such as playback mode and scene settings. It works surprisingly well and if it isn't for you, can be deactivated via the menu. With the GPS function you are able to record the exact locations of every photograph you take. 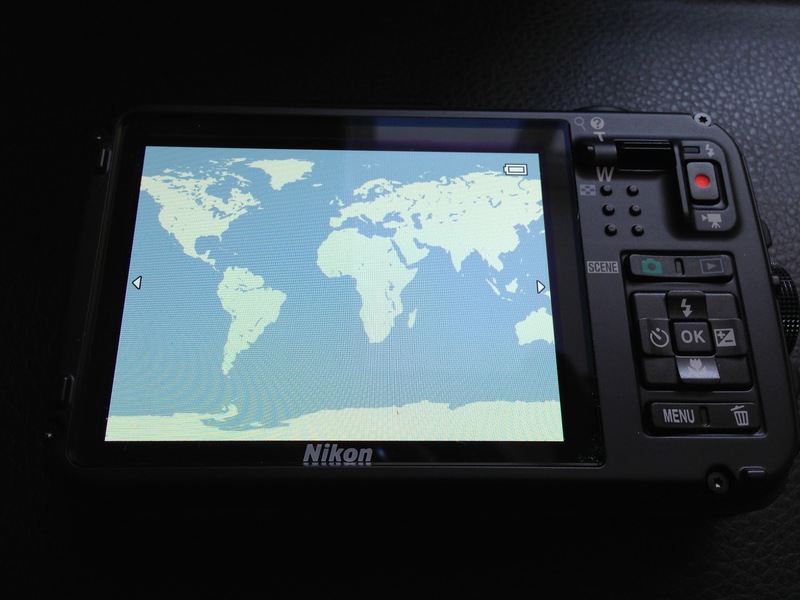 You can share your locations of Google Earth, Google+, other social networking sites and even with the included Nikon View NX2 software. It does mean that the battery won't last quite as long but it is all clever stuff and a great feature to have and dip in to. Video can be recorded in full 1080p HD at the touch of a dedicated button. The recorded sound quality is good and in stereo. You can also record in other video qualities. The short clip below was taken at the Tweed Run while I was on a bicycle and waiting to proceed. It was starting to rain and the light was not wonderful. Battery life is quoted at 250 shots with a charge time of approximately 2 and a half hours. I was able to get just over 300 shots before the battery died. My daughters older AW100 use the same battery and we were able to buy a spare for a few pounds as a backup for them. I have only been allowed to borrow the AW110 for two weeks but I will be very sorry to see it go. It has lots of features retained from the AW100 but the updated screen, button layout and the addition of WiFi makes this a worthy update. I cannot tell you how useful it is to be able to link my iPhone or iPad to the camera and perform all manner of tasks. Yes you can take a picture with your phone and post it on FaceBook, Twitter or email it to someone but the camera on my iPhone is nowhere near as good as the AW110. In addition to this, there is no way I'd take my iPhone out of my pocket if it was raining or snowing. 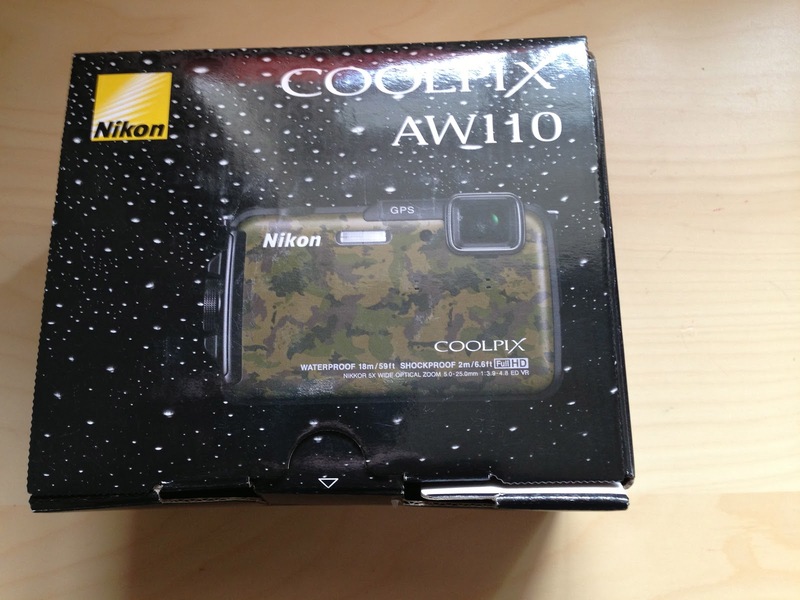 For anyone active who wants a rugged, strong and waterproof camera the Nikon AW110 is the way I would go. Mainly directed at sporty/adventurous types, I would argue it is the perfect family camera. My daughters have the AW100 and they have been knocked about, dropped, thrown and submerged in all sorts of water and still going strong! For me this is virtually the perfect camera. It is small enough to put in a pocket and almost forget that it is there. It can be used to take great photos and videos in the sort of conditions where cameras would fear to tread and it is rugged enough to take the odd knock and drop. If I were suggesting possible features for the next AW camera, as someone who takes lots of photographs having a dedicated aperture priority mode and a faster lens would be great but is this the sort of camera that needs these features? Probably not. As I have written, I was more than happy to leave the camera in auto mode. The true test of whether something is good or not is how you feel when you have to give it back. I have very reluctantly had to give the AW110 back to Nikon and I will miss it and its go anywhere, do anything credentials. A really big thanks to Nikon UK for letting me borrow one of their cameras and especially to Lily. You can buy the Nikon AW110 at good electronic / camera shops on the high street and online for anything between £280 - £340 and if you register it with Nikon you can get a two year guarantee. Thank you, this was really thorough and helpful. I love my Lumix but it's really too bulky for on-the-bike action and I've been thinking of finding something more compact. This looks just the ticket. I'm a mountain biker and I'm planning to buy a water, shock proof camera. I've been reading reviews on Nikon, Lumix and Olympus and most of the review said that the image from Nikon is the best. To me the most important spec beside image quality is how responsive is the camera. Currently I'm using a non water and shock proof Canon Powershot. Well the image is OK but the biggest gripe is the autofocus and inability to use it when it's raining. Having the best camera in the world is worthless when you've to keep it when it's raining. I have tried for hours and hours to link my AW110 to my iPad with absolutely no success. Is there a step by step process for idiots listed somewhere? I have downloaded the Nikon wireless app on my iPad successfully, but the camera keeps asking for a password when I try ti link the two. What gives? Hello James. I managed to do it pretty easily. I just followed the instructions in the manual (which you can get online I believe). Hope you get it working as it's a great feature.